Aside from the cozy, well-appointed cabins (VRBO#s 993127, 661493, 449876) in a stunning and unique location, you are surrounded by art at Between Beaches Alaska. Ceramic sculptures as well as instillations made from copper, glass floats, drift wood, other beach combing finds, and clay are around every corner--even in your shower! Also, don't miss a tour of the art studio where Kristi works all winter to provide you with one-of-a-kind ceramic pieces and art kits for purchase that are perfect way to remember your time at Between Beaches Alaska--look us up! The waters of Kachemak Bay are some of the richest in the world for sea life, offering visitors an unforgettable experience. Here you will see whales, bald eagles, and sea otters from your doorstep. The unique geology of the area has produced a fantastic setting for beach combing, tide pooling (best at minus tides), fishing and wildlife. Watch the sun rise over one beach and set over the other. Each cabin (VRBO#s 993127, 661493, 449876) has a PRIVATE bathroom with flush toilet and artistic hot shower and a sunset view! Outdoor fire pit , you may use either beach. from your beach chair or inside the art gallery. including Folgers medium roast, Joy creamer, and sugar. There are private dinning areas both indoors and outside. Access to the sauna any time! Greetings, You will take a scenic water taxi to reach us, departing from the Homer Harbor, it's 30 minute ride through beautiful Kachemak Bay State Park. Between Beaches is located on an ancient glacial land formation know as a Terminal Moraine. Named Macdonald Spit, it extends out into the bay. Because of this unique property we are situated on, we have it all! Here are long sandy beachs, running water, electricity, full sun any time of the day in one of the many private Adirondack chair seating areas, and no bugs! All this and still easy access to pristine hiking trails, and the quaint village of Seldovia. This land formation offers two beaches to explore, either by land or by sea. With two beaches, if it is breezy on one you simply walk 100 feet to the other beach! Our cabins were designed to fit between old growth trees, none were cut for these building sites and many reclaimed materials were used. We are a third generation family owned and operated business. come join us! Beautiful well equipped cabin on the beach. We are repeat customers of Between Beaches and enjoyed our stay as always. All cabins are well equipped, clean, and cozy. Owner is friendly and knows all the special touches guests will appreciate. Thanks for the yummy chocolates and bed warmer! We are return guests and love all of the cabins at Between Beaches. We will continue to stay here every time we visit Seldovia. Cabins are fully stocked with all your basic needs and the artwork is amazing. Beds are super comfy after a long day of exploring. The owner is friendly and always willing to help with anything you need. Be sure to check out her art gallery for some art kits too! Don’t hesitate to stay at any of these cabins - you won’t be disappointed! We can’t wait to return! Carefully crafted cabins in a secluded paradise! Besides the location which is an unbelievable bounty of wildlife, beaches and views, our cabin was beautiful and our stay comfortable. The hostess took great care in creating this paradise in an artful and visually elegant and attractive fashion including the cabin, art gallery, sauna and hot tub. We found everything we needed and were even able to purchase fresh fish. We took full advantage of the amenities and even used the provided equipment to dig for clams which were clean and delicious. As far as the wildlife, we never saw a greater concentration of animals anywhere else during our trips; we saw bald eagles with young, otters, loons and a myriad of ocean creatures in the tidal zone including octopus and nauti branches. We picked berries and enjoyed every inch of this amazing place and always felt the comfort and artsy character of our cabin charming and elegant. We could not have enjoyed our stay more in a place more unique and wonderful than this. We had such an amazing experience at Kristi's place! Kristi is such a wonderful host, and her place has everything. Long walks on the beach, beautiful sunsets, kayaking, tide pooling, evening beach fires, you couldn't ask for anything more. The cabins are very well taken care of and had everything you would need! Definitely going back again! Thank you & looking forward to seeing you again! The pioneer cabin is a cozy and inviting place to stay. The entire property is landscaped and maintained beautifully. Kristi has adorned the cabins with wonderful artistic touches. And being fishermen they have available the most delicious and well priced cuts of fish, just steps from the cabins. This is truly a lovely place to stay if looking for a bit of rest and relaxation. We had a wonderful stay (three night stay) here at Between Beaches, and will definitely come back another summer. If you are looking to book at trip here, I certainly recommend it. The owner is really sweet and caring, and the property itself is marvelous. You often have Mc Donald's Spit's beaches all to yourself, which is great if you are looking for some solitary fishing time in the bay, or some peaceful beachcombing. The cabin itself has a lovely view of the bay and the cabin is nestled in the trees. The décor is mostly made by the owner, Kristi, and you'll find the shower has a really nice design. She provided us with massive salmon tails each night for the BBQ for a fraction of what I pay at home. We also enjoyed world class kayaking steps from the cabin (we had Mako Water Taxi deliver the kayak when they dropped us - very easy). Great place to stay, no reason to leave the property, ton to do and experience. 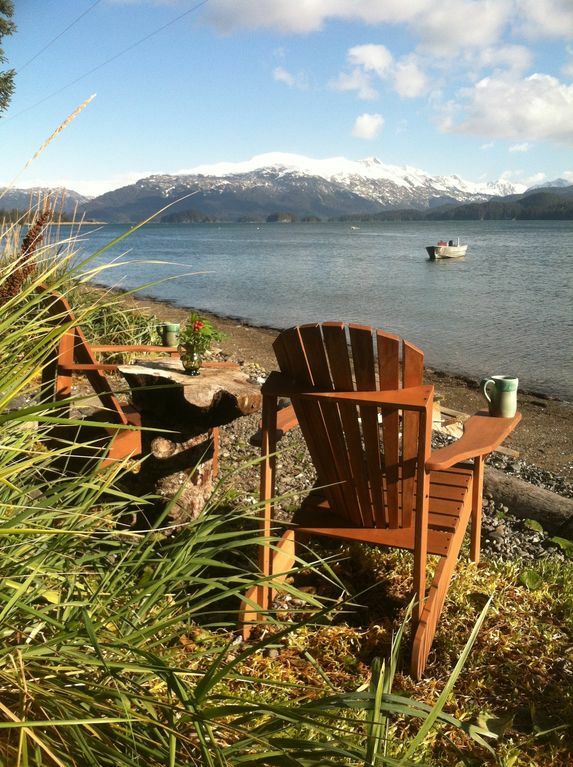 Between Beaches, one of Alaska's most beautiful destinations, is the ideal location for vacationing singles, couples, and families. Just as the name states; Between Beaches is situated on MacDonald Spit, a mile long finger of ancient glacier moraine, with beach frontage on Kasitsna Bay and Kachemak Bay. Located 13 miles SW of Homer and 8 miles NE of historic Seldovia, Between Beaches is easily reached by water taxi from the Homer boat harbor, the State ferry Tustumena to Seldovia, or a short airplane ride to the Seldovia airport. Arrivals in Seldovia will require a short taxi and walk. This cabin is smoke free. Guests who smoke in the cabin will be charged a $300 cleaning fee. Kayaks now included with rental! Dogs must be on leash during their stay.